Of all the music that Van Morrison has produced since he had it with Them and got down to blowin’ your mind, Astral Weeks remains his most enigmatic to date. The 1968 album — only Morrison’s second as a solo artist — fused elements of Celtic folk, psychedelic rock, and free-form jazz while its verses yielded an automatic writing style that suited its serendipitous air. 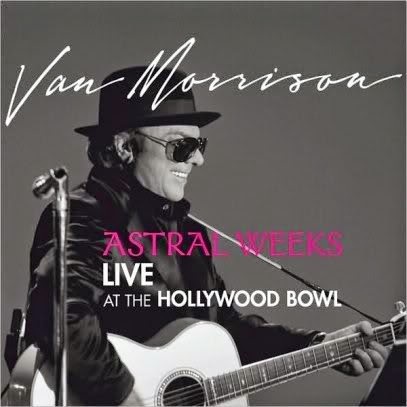 Forty years later, Van Morrison revisited this seminal work in full for the first time — recorded last November and recently released as Astral Weeks: Live at the Hollywood Bowl — his performance electrifying both in its own right as well as in complement to its mystic precedent. Sounding like he’s channeling an altogether new spirit rather than replicating old magic, Morrison invests these classic songs with a jolting dose of soul and sentience. His voice deepened and richer with age, he asserts his Irish mettle amid the music’s ethereal minutiae, whether bellowing above a blanket of strings and harpsichord on “Cyprus Avenue” or crooning in and around the broken-time percussion/brass wallop that tempts “The Way Young Lovers Do.” As mighty as Morrison comes across, though, he mercifully doesn’t overpower the nuanced dynamics afforded by his band. In fact, he often sings (and wails and growls) with marked restraint, summoning the melodic fragility of songs like “Beside You” and “Sweet Thing” to the fore. Morrison works off these ephemeral flourishes — like the crying violin winding through “Slim Slow Slider” or the muted, mournful flute serenading “Madame George” — inflecting his voice in intuitive, at times guttural response. Morrison concludes by playing two non-Astral tracks — “Listen To the Lion,” culled from Saint Dominic’s Preview, and “Common One” — the former fitting in gorgeously here. If anything detracts from the pleasures of this performance, though, it’s his rendition of the latter. While underscored with rich gospel flavor, Morrison affects a domineering call-and-response routine with a background vocalist, spouting lyrics like mantras in a grating, almost indiscernible flurry. Such is but a slight criticism, however, when considering how well Van Morrison has translated Astral Weeks to the concert stage, illustrating that not only has the album lost none of its resonance, but, so too, neither has its creator.